The area offers an easy meandering drive, but you’ll definitely want to park and stroll through the villages or perhaps bike the miles of trails that unfold along green rolling hills, inviting lakes, wineries, orchards and farms. 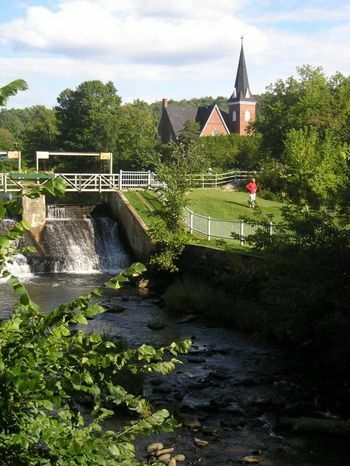 The Eastern Townships have so much to see and do that I suggest spending a few minutes doing preliminary research on their well-organized website. Several self-guided tours are offered: The Wine Route, a breathtaking Summit Drive, a historic Township Trail, a tasty Agro-tourism exploration, as well as detailed descriptions of the different townships and villages. Not a planner? You’ll still have a marvelous time if you simply go where the wind blows–unearthing treasures at the many antique stores, artist colonies, cheese shops, or wineries, stopping to dine at intimate restaurants that feature farm-fresh products, sleeping in historic country inns or romantic B & B’s. You‘ll sample delicious regional wines, sip sparkling cider, nibble some foie gras, maple products or stinky cheese. You’ll marvel and learn from the local vintners, farmers and producers that live on donkey farms, lush lavender fields, even a Benedictine abbey. Part’s 2 & 3 will include “My not-to-be-missed stops”.